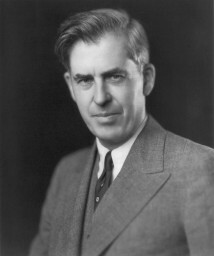 A brilliant but strange man by the name of Henry A. Wallace, who once served as Vice-President of the US, is responsible for much of fractivism today. Henry A. Wallace has to be one of the strangest individuals in American political history. He exited the political scene some 67 years ago, in 1948, when he ran an unsuccessful third-party campaign for President as the nominee of a radical Progressive Party. He died in 1965, long before fracking became a household word, but has had a profound and radical influence in fomenting fractivism today. It’s just another part of the strange legacy of a man who, despite, his obvious brilliance, was almost always marching to the beat of a different drummer, sometimes with valor, but often simply out of step with reality. I expect many readers have no idea who Henry A. Wallace was, but his legacy is one of extensive influence today in sustaining the fractivist fraud, as his heirs have used the money he made to finance it. Born in Iowa in 1988, Wallace was influenced as a boy by the famous George Washington Carver and starting experimenting with plant breeding when he was only 10 years old. He later became the editor of family agricultural publication and a pioneer in the field of agricultural science, also founding what eventually became the famously successful Pioneer Hi-Bred seed company. Still later, he was chosen by Franklin Roosevelt to be Secretary of Agriculture (his father had earlier served in that capacity). He was then chosen as Roosevelt’s Vice-President for the 1940 campaign and served in that capacity until 1944 when he was dropped from the ticket for the fourth term campaign. Roosevelt, however, shortly before he died, did ask Wallace to serve as Secretary of Commerce, which he did until Harry Truman fired him in 1946. Wallace, no doubt frustrated he had missed succeeding Roosevelt by a matter of days, ran for the office himself a few years later against Truman but it wasn’t to be. He got 2.4% of the vote, which is, of course, why the Park Foundation funded Truth-Out team can only dream of what might have have been had this utopian made it to the top. Along the way, Wallace earned a reputation for being soft on communism, later apologizing for being taken in by the Stalinists, even publishing an essay called Why I Was Wrong. He also entertained many strange philosophies, but none of that is relevant to his influence today. What is relevant is that the man made a fortune from agriculture that is being used today by his descendants to cultivate the worst forms of fractivism. 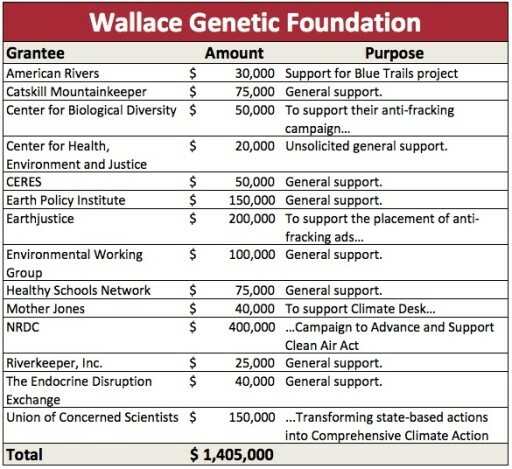 In 1996, the three trustees of the Wallace Genetic Foundation agreed to split the original foundation into three separate foundations: The Wallace Genetic Foundation, Wallace Global Fund, and Wallace Research Foundation. These three foundations remain separate. Each foundation continues but reflects the individual interests of each trustee. The Wallace Global Fund concentrates on destroying food production worldwide through grants to extremists intent on opposing high-yield agriculture. Well, yes, but now fracking, of which Henry A. Wallace probably never heard a word, is a target as well. The shift in mission by the second and third generation to something directly opposite away from the views of the maker of the money is, of course, a classic demonstration of trust-funder guilt at having done so undeservedly well by the grace of the old man. They always try to make up for it by showing how different and how much more compassionate they are, hoping to convince themselves they’re of equal or higher stature and really do deserve all that wealth and recognition. It’s Trust-funder Psychology 101. The Wallace Global Fund split into two n 2009 when Bruce and Susan Wallace created a separate foundation called the Woodtiger Fund, so there are at least four foundations spending Grandaddy’s money today. Here’s what it funds and, once again, the Delaware Riverkeeper shows up to claim a big wad of bills, bringing its total Wallace haul to $750,000 for the latest year available. What’s especially ironic about the Delaware Riverkeeper taking money from the Woodtiger Fund is this; it was, in 2013, invested in numerous oil and gas companies, including Exxon-Mobil, which, of course, Maya Van Rossum has been attacking with the same vengeance she applies to anything remotely related to the economic welfare of the Delaware River basin. That’s the type of hypocrisy prevalent throughout the fractivist funding world, of course, but it’s the least of the problems. The biggest problem, rather, is the radical influence of these organizations over policy. 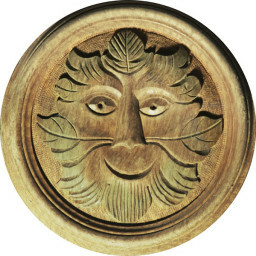 What we have in the case of these four foundations is relatively old money generated by a long dead loose cannon personality, but one who was at least dedicated to improving the lot of the downtrodden, now being spent to further the utopian schemes of his progeny – schemes that invariably work against economic opportunity and the needs of the downtrodden common man. Henry A. Wallace was a bit of a nut to be sure, but he was an honest man who pursued his own utopian dreams for the right reasons and actually did some great things. His work on seed corn productivity, chicken breeding and agriculture in general helped tens of millions. His descendants are using what he produced (a combined $7.3 million for the latest year) to thwart everything for which he worked and frustrate everyone for whom he cared. 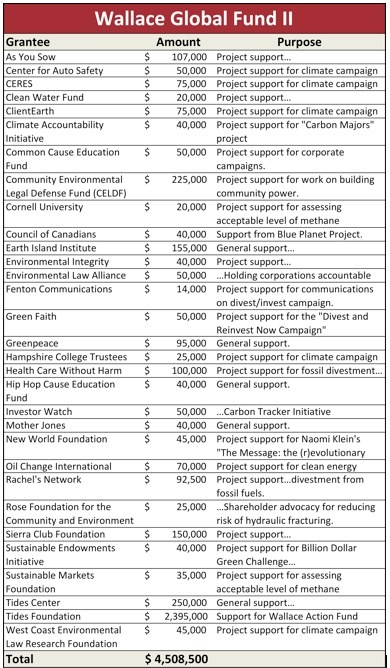 Such is the nature of most of the trust-funders financing fractivism. Kevin this is great to hear,I hope many more move in the same direction? This would be a good subject for Rachel B. to do a peice on? Tom, I ‘m glad you are looking at this because there is this frightening thing happening within the environmental world. 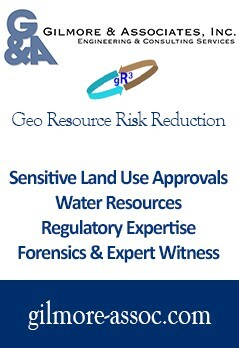 There are obvious overlaps between GMO issue and fracking activism, certainly with Food and Water Watch. There are celebrity chefs and folks like Hilary Baum for example who seem to have more influence with those in power than say the farm bureau, certainly on the issue of fracking in NY state. There seems to be an overlap too with the activism–rejecting technology and science and a real unwillingness to look at important topics like food and energy production or use in a balanced, reasonable and practical way.